After two events in Africa kickstarted the season, Spain hosted the first European leg of the UIPM 2019 Global Laser Run City Tour in the Catalan city of Tarragona. Using the facilities created for the 2018 Mediterranean Games, Tarragona (ESP) created excellent conditions for Laser Run with more than 150 participants competing, many of them experiencing the UIPM’s fastest-growing sport for the first time. 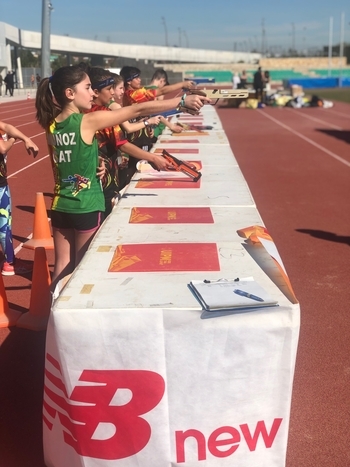 The event on March 10 was organized by the Catalan Federation of Modern Pentathlon and the Tarragona Pentathlon Club, with support from the Spanish Modern Pentathlon Federation and a number of sporting bodies from the Catalan region. Medals were presented by Maria Elisa Vedrina of the Tarragona Sports Council, Tarragona Pentathlon Club President Pedro Otto and Xavier Lechuga of the Catalan Federation. A spokesperson for the local organising committee said: “Tarragona hosted its first Global Laser Run City Tour in an ideal setting at the facilities of the Mediterranean Games 2018, and a sunny and amazing day was made more pleasant still for all families and participants.